Using your hard earned money to pay someone to oversee your hard earned cash sounds like a conundrum but let’s see what life looks like when you try to go it alone. 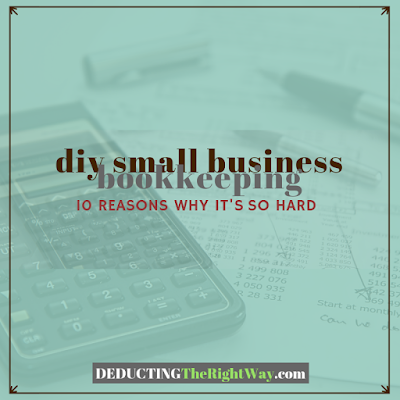 DIY small business bookkeeping sounds like it's easy, economical and efficient but there is a reason so many owners hand it over to a professional. You are wearing too many hats. Most small business owners do not have the time to keep up with all their bookkeeping tasks. You promise yourself that it will get done tomorrow, but tomorrow comes and goes. It’s best to hire someone who lives and breathes small business accounting so you can get back to focusing on your operations. You dread logging into your small business accounting software. If you are finding it difficult to face your financial figures, then it’s a sign you need help. You should never feel lost or discouraged. It’s time to speak with a small business accountant. You have unanswered questions. Let’s face it; you will eventually have a problem that desperately needs an answer. Scouring the Internet to piece it together isn’t exactly what you imagined when you started your business. It’s always better to get custom-tailored advice that makes sense. You are likely mishandling transactions in your software. You may be under-reporting your income when you incorrectly deduct expenses or mistreat fixed assets. It can lead to stiff penalties and interest if the IRS reverses those transactions. You can avoid sleepless nights by working with an accountant. You have past due receivables and payables. When your accounting is not up to date, you do not have accurate records such as who owes you money and vice versa. By hiring an accounting expert to perform a checkup, you can catch your mistakes before it’s too late. You may open yourself up to an audit. Do-it-yourself accounting can lead to significant bookkeeping mistakes, and your accountant reports them on your tax return which the IRS may uncover. Unless you are willing and able to get a degree in accounting, you are better off leaving it to the experts. You pay more taxes at the end of the year. When you postpone everything until the last minute (after the tax year closes), you do not have many options left. A licensed and experienced tax accountant has the specialized knowledge to create tax strategies that help reduce your tax burden, but it has to occur during the tax year not afterward. You make it harder to get a loan. The time may come when you need a loan to expand your business. Lenders want accurate reports and solid tax returns; not a DIY approach to your company’s financial picture. Messy records and imprecise accounting will not impress them. However, they like speaking with an accountant familiar with your company’s operations and can also provide a verification letter. You may not sell your company for top dollar. Poor record keeping and unattractive figures scare potential buyers, plus vague explanations or excuses only make it worse. Your business is a long-term investment that needs to pay off, so work closely with an accountant to protect your interests. You may face haggling from a potential partner. Your goal may be to add a partner who can bring in new clients for a fresh flow of income, and share in the expenses. However, when your accounting is not exactly up to par, it permits the future partner to bargain the value. You can prevent this from happening by working with an accountant who has your back. Small business bookkeeping training offers a deeper understanding and lets you become an informed decision maker. TIP: While it may seem like you can handle everything on your own, the better option is to work with or be mentored by a licensed tax professional. What does that look like? You can take part in online accounting courses or subscribe to an online FAQs portal.